New Delhi, April 11: Today, April 11, marks the date of first phase of voting for the Indian General Elections 2019, also known as Lok Sabha Elections 2019. The Indian elections are termed as the biggest voting exercise anywhere in the world, due to the large size of voting population. This time, 900 million voters (90 crore) will exercise their right to elect a government in India. Google has done its bit by dedicating a doodle to the cause of Indian elections. 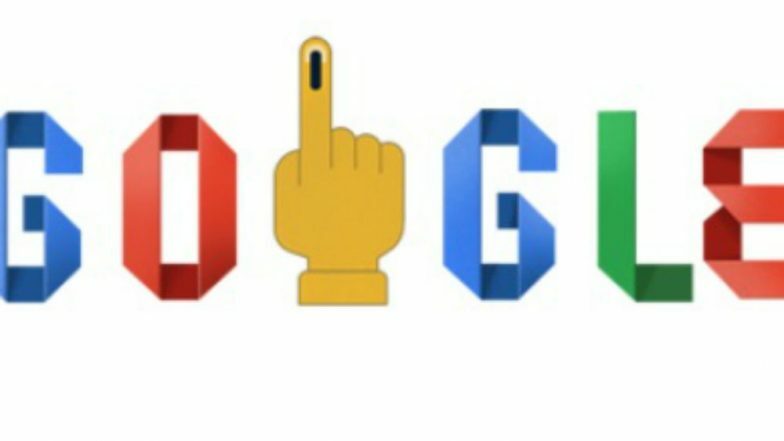 The search giant has put up a doodle with an inked finger and contains description of "how to vote." How To Vote #India? How To Use EVM and Verify on VVPAT? Tutorial On Casting Vote Ahead of Lok Sabha Elections 2019 in India. The Google doodle description of how to vote in the Indian General Election 2019 contains detailed instructions of who can vote and how can one vote. It contains answers to questions like "Find Polling booth (Where to vote), How to use EVM (VVPAT), When is the Election (Election dates)?" Lok Sabha Elections 2019 Schedule: Voting In 7 Phases From April 11 to May 19, Counting And Results On May 23; Check All Dates For General Elections. In India, voting for the Lok Sabha Elections 2019 will take place in seven phases beginning from April 11, 2019. Elections in all the states and UTs will be held on April 11, 18, 23, 29, May 6, 12 and 19. The counting of votes will take place on May 23. Stay tuned to LatestLY for all the latest updates of Lok Sabha Elections 2019.